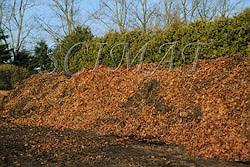 Nowadays most people are knowledgeable of composting and its benefits in recycling organic waste. A wide variety of microorganisms, such as bacteria and fungi, decompose organic material and form compost. Some of the microorganisms are thermophilic, i.e., they prefer higher temperatures. Thermophilic composting kills harmful microorganisms and weed seeds, thus converting organic waste into fertilizers even for gardens. 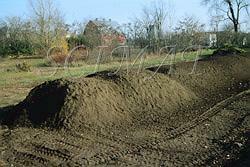 Terms related to compost making may be found in a compost glossary. 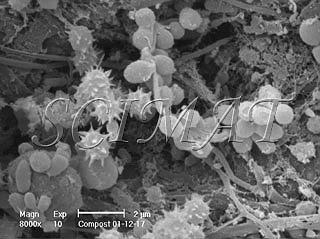 The above images were obtained using a scanning electron microscope (SEM) which makes it possible to obtain images of microorganisms (and other objects) at magnifications of up to several thousand times. Figs. 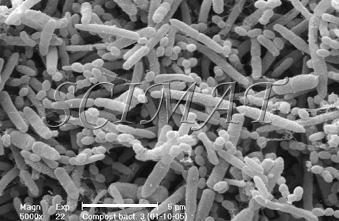 1 and 2 were obtained by inoculating a liquid nutrient medium with a garden compost extract, culturing the microorganisms at 30°C for 24 hours, capturing them on bacterial filters, and preparing them for SEM. The other two images (Figs. 3 and 4) were obtained by fixing compost particles in a glutaraldehyde solution, dehydrating them in ethanol, drying them, and using an SEM to search for microorganisms. Fig. 1. Bacteria included elongated bacilli and round cocci. Fig. 2. 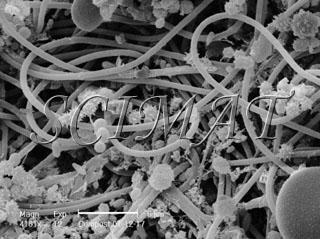 At a higher magnification, the bacteria vary in size. Fig. 3. 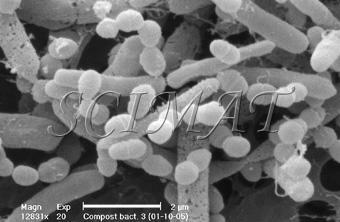 Some very long bacilli were found directly in the compost. Fig. 4. A variety of microorganisms including fungal spores was noticeable in addition to the decomposing plant material in the background. For information about the micrographs, please contact the author.